lightweight alternative to ceramic planters. This planter offers excellent all-weather durability. planter pots as thoughtful gifts for family and friends, or keep them in your own home to bring the perfect dash of fun to your living space. 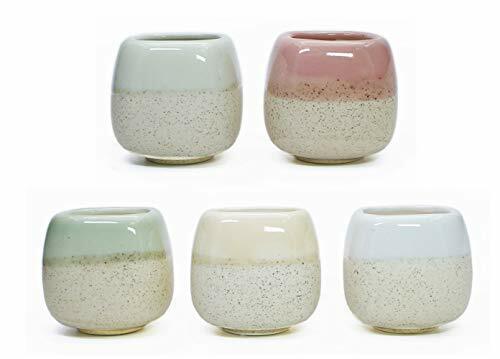 *Modern style and classic elegance can both be yours when you make these lovely flowerpots a part of your home or patio. Goldblue Flowing Glaze Five Color Base Serial Plant Pot made of ceramic materials perfect for holding succulent or cactus plants. Beautifully glazed with elegant,suitable for decorative gardening,desk,bookshelf,dinning table,living room,hosting room and everywhere. Pack of 5. Aprroximate Size:2.2Inchx2.3Inch (L x W),There is a small hole in the bottom that the water can flow through it.